Tobermory is a pretty little port with colourful houses curving around the harbour. 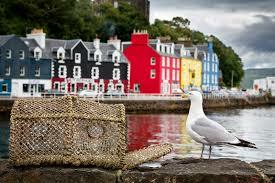 The picturesque setting of the harbour buildings was used in the TV program Balamory. It’s the Capital of Mull and you will find most of the Mull attractions are situated in or close to the town. Here you can visit the Mull Museum, Marine Visitor Centre, Tobermory Distillery, Art Gallery or Theatre. Up above the village on the cliff-tops you will find Tobermory Golf Course from where you have a panoramic view right across to the Ardnamurchan Peninsula. Have you checked out our isle of Mull Guide?